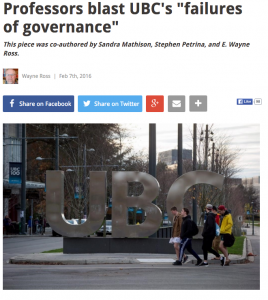 Montalbano and the UBC Board of Governors continue to operate in secret, striving to keep the public as well as university faculty, staff, and students ignorant of the rationales and actions of the highest governing body of this (when I last checked) public institution. In his response to UBCFA president Mark Mac Lean, Montalbano said the board recognizes in the absence of “concrete information” there will be speculation on the circumstances of Gupta’ departure as president. While he stated that “the rumours or speculations that have been publicly raised have contained numerous inaccuracies” he offered no clarifications nor did he offer any explanation about what transpired to end Professor Gupta’s presidency after only one year, or what caused this leadership crisis. In his letter, Montalbano declared that the Board acted “in accordance with” the University Act and UBC Policies; that the Gupta’s departure was not a failure in governance; and that the Board acted responsibly and with every consideration for fairness. Montalbano writes, “The university is place of open dialogue and transparency,” but not when it comes to the Board of Governors. Invoking “non-disclosure agreements” and the always dodgy “this is a personnel matter” excuse for the Board’s failure to be transparent and accountable to the university community and the public about the departure of the president of a university with 60,000 students, 15,000 faculty and staff, and a $2.1 billion budget, puts a lie to any rhetoric about UBC as a place of open dialogue and transparency. In essence, Montalbano’s letter is a statement that he and the UBC Board of Governors are accountable to no one. Have a question for the UBC Board? Be prepared to be treated like a mushroom. Gupta’s “sudden and immediate resignation” last Friday and the UBC Board of Governors lack of transparency on the reasons behind Gupta’s departure has produced much skepticism and speculation about the leadership of the university. The Board of Governors must explain what transpired to end Professor Gupta’s Presidency after only one year. What caused this leadership crisis? Does Professor Gupta’s resignation mean the Board no longer supports realigning the University’s resources to better support the research and teaching missions? We have in progress searches for a Provost and VP Academic, a Vice President Research, and a Vice President External and Communications. Those who fill these positions must ultimately hold the confidence of the President they will serve. What will happen with these searches now? President Emerita Martha Piper has considerable experience as a past UBC President, but should she hire three key Vice Presidents for the next President of UBC?